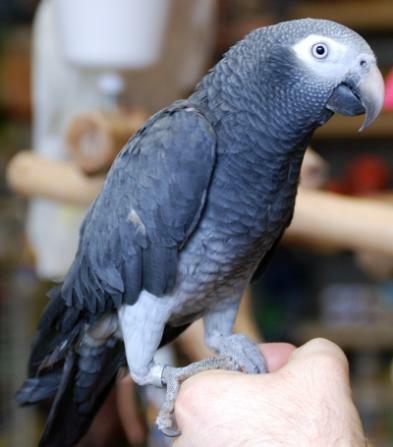 Two subspecies of African grey parrot are currently recognised: Psittacus erithacus erithacus, sometimes known as the red-tailed African grey parrot or the Congo African grey parrot, and Psittacus erithacus timneh, also known as the Timneh African grey parrot. Both are from Africa, with Timneh found in a smaller area, including Liberia and the Ivory Coast region. 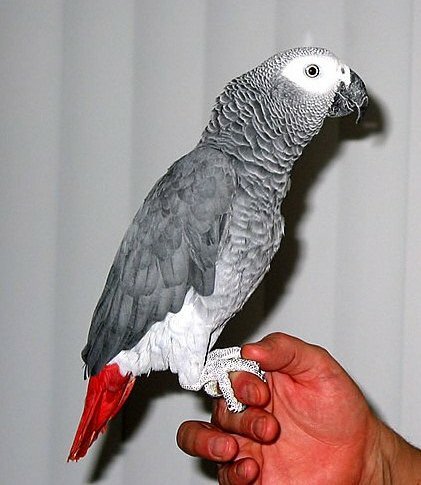 The Congo African grey is slightly larger than the Timneh, and has bright red tail feathers. The Timneh's tail feathers are darker and overall the Timneh usually has slightly darker coloration than the Congo, especially over the back (although not always the case). While the Congo's beak is grey, the Timneh's upper mandible is bone coloured with a dark edge, while the lower mandible is grey. - These are smaller in size, have a darker charcoal grey coloring, a darker maroon tail, and a light, horn-colored area to part of the upper mandible. - As pets, Timnehs begin learning to speak earlier than Congos and are often said to be less nervous around strangers and novel situations. Parrot full species status and it was classified as Vulnerable. - This is the nominate subspecies, larger than the Timneh at about 33 cm long, with light grey feathers, cherry red tails, and an all-black beak. Immature birds of this subspecies have tails with a darker, duller red towards the tip until their first molt, which occurs when they are 18 months of age. - These birds also initially have grey irises, which change to a pale yellow color by the time the bird is 1 year old. - The Congo Grey parrot is found on the islands of Príncipe and Bioko and is distributed from southeastern Ivory Coast to Western Kenya, Northwest Tanzania, Southern Democratic Republic of the Congo, and Northern Angola. - In aviculture, it is often called a "CAG". Below you will see a Timneh and a Congo African Grey eating from the same bowl. Can you tell which is which?